The ethics line is changed each month and can be found by calling CPA at 303-692-9303. Upon request of the CPA Ethics Committee, the Board of Directors recently changed the scope of authority and focus of the Ethics Committee. Adjudication, the process of investigation and discipline for violations, was eliminated from our mission. The Ethics Committee is now focused on addressing questions of ethics and professional conduct in a solely educative and consultative manner. Historically, a primary function of the Ethics Committee was to investigate and adjudicate ethics complaints against CPA members, and to make recommendations to the Board of Directors regarding supervision, suspension and expulsion. There was a time when this served a valuable function within CPA by assisting in maintaining high ethical standards for members and protecting the public. The adjudication function is no longer needed, for the Ethics Committee, as are all psychologists, is under the obligation to report ethically problematic cases to the Psychology Board of The Department of Regulatory Agencies. DORA then investigates and forwards their decisions to us. It is redundant and potential double-jeopardy for a CPA member for us to continue our own investigations and adjudications. Additionally, such investigations took a lot of time and energy. The process typically involved extensive document review, meetings and interviews, as well as investigative subcommittees and hearings. The time commitment of committee members was significant, detracting from our educative activities. Our adjudicative role also ran the risk of placing the Ethics Committee in an adversarial role with CPA members. CPA members could perceive the Ethics Committee more as opponents who were a threat for punishment, than educators who were an asset to improve practice. Adjudication also exposed the Colorado Psychological Association to litigation and liability risks. 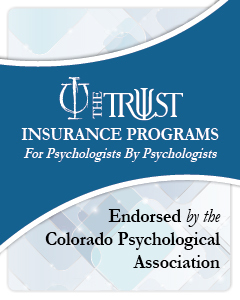 In addition to email blasts, articles in the TCP, and ethics presentations, the primary way we educate the CPA community is through the Ethics Committee Psychologist Consultation Call Line (303-692-9303). An Ethics Committee member receives calls from CPA members and others and seeks to answer questions in light of the APA Ethical Principles. Over the years we have received many calls regarding confidentiality, dual relationships, termination, payment issues, telehealth, conduct of colleagues, competence, questionable interventions, and sexual issues. The CPA Ethics Committee is committed to remaining a valuable resource for CPA members, and we hope you will utilize our consultation and education services. Andrew Loizeaux obtained his PsyD from the University of Denver, School of Professional Psychology. He specializes in family forensic and psychotherapy services with Katz & Loizeaux Forensic Services, LLC and is a member of CPA’s Ethics Committee.